16 September 2016, Suva - Pacific Leaders’ endorsement of the Framework for Resilient Development in the Pacific (FRDP), the world’s first integrated regional framework to build resilience to climate change and disasters, has been applauded by Pacific regional and international organisations. The Framework aims to ensure that climate change and disasters are understood as a development challenge with priority actions to address vulnerability to climate change and disasters and build resilience across all sectors. The FRDP provides high level voluntary guidance to national governments and administrations, the private sector, civil society organisations, Pacific communities, regional organisations, and development partners. The FRDP advocates for the adoption of integrated approaches, whenever possible, for addressing climate change and disaster risks, in order to make more efficient use of resources, to rationalise multiple sources of funding, and for more effective mainstreaming of risks into development planning and budgets. The Framework is closely aligned to implementing global agreements such as the Paris Agreement, the Sendai Framework for Disaster Risk Reduction and the Sustainable Development Goals to help build a more sustainable and safer region. A new Pacific Resilience Partnership (PRP) will coordinate cooperation as well as implement and monitor the FRDP. The Pacific Island Forum Leaders approved a Working Group to establish the structure of the Partnership. The FRDP was developed in response to recommendations from the Pacific Platform for Disaster Risk Management and Pacific Climate Change Roundtable in 2011 and endorsed by the Pacific Island Forum Leaders in 2012. An extensive and inclusive consultation process was undertaken over the last three years with Pacific Island countries and territories (PICTs). Input was also received via regional meetings, sector dialogues and an online tool that drew submissions from around the world. The development of the FRDP was supported by a Steering Committee comprising of representatives from PICTs, civil society and the private sector. A Technical Working Group provided technical advice and support to this process and comprises representatives from the Pacific Community (SPC), the Secretariat of the Pacific Regional Environment Programme (SPREP), Pacific Island Forum Secretariat (PIFS), United Nations Office of Disaster Risk Reduction (UNISDR), United Nations Development Programme (UNDP), and the University of the South Pacific (USP). 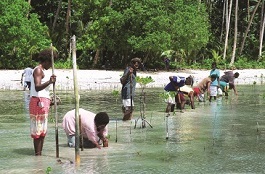 The development of the FRDP has been supported with funding from various sources including: the European Union through the Building Safety and Resilience in the Pacific (BSRP) project and Global Climate Change Alliance (GCCA); the Australian Government (DFAT) through the International Climate Change Initiative (ICCAI) and funding for SPREP and SPC; the Government of Sweden support for the Pacific Climate Change Roundtable through SPREP; and United States Agency for International Development (USAID) through the USAID Institutional Strengthening in Pacific Island Countries to Adapt to Climate Change (ISACC) project. The Framework for Resilient Development in the Pacific: An Integrated Approach to Address Climate Change and Disaster Risk Management (FRDP) was endorsed by Leaders during the 47th Pacific Island Forum meeting in the Federated States of Micronesia.